At archive also there are additions for this game. These cool races with simple design are capable to deliver to you emotions at all at least, than "fancy" NFS or the Formula 1... The baby allows simultaneous involvement to 6 players, possesses almost full mandatory "a gentleman's set the" of settings inherent 3D - to races, and thus everything looks before funny that it is possible to start laughing already at the sight of the first screen of game... In rally settings you can create the profile - to select the machine (from 12 different from racing to the truck), to paint it favourite color, and also to paint the driver's "suit" (see the first screenshot), to set command keys. 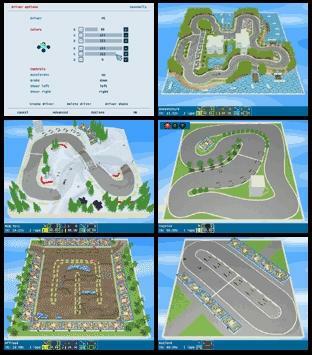 In the main menu 16 routes of which you can make to yourself the championship (by the right button it is possible to receive preview and information on the route) are offered to you. In inline tunings play with permission, effects, the principle of a zaschityvaniye of winners, etc. If doesn't involve standard sound design, it is possible to deliver "funny" - listen that will be Select from what quantity go and with whom (with a computer, the companion or with yourself), put quantity of circles on the route and forward! (If you go one, it is possible to set the option "ghost car" when your own shadow competes with you, repeating your best circle.) The truth with control first there will be difficulties - the route doesn't rotate also the single look on top-in front during race can't be changed. If you strongly beat the machine, at your service always some groups of the repairmen built along the route (don't press them, regret!) . Incomplete race can be saved. The editor of routes whom you will quickly understand is applied to game and you will be able both to import and change already ready routes, and to create own. In the new version in the editor some objects were added that will also give to your tracks more beauty and originality.